On screen, floating menus and options have become very much popular in the smartphone devices. So, in the below guide we will be guiding you to get on screen navigation buttons in Pie Style. The messages and notifications can be also received through these methods directly on the screen even if you are running any of the applications, default functions of the device or whatsoever. Like you can access up the various things through the on-screen functionality and you can also set up the navigation buttons on your screen for permanent so that you can get access to their functions easily. Using up these style of on-screen buttons will let you help by preventing you from working with both the hands on big screen devices and do the function of the real navigation buttons easily. To know about the method of how you can also set up the On Screen Navigation Button in Pie Style on your device just go through the article given below. Below we have stated all the possible methods that you can use to get this pie style navigation buttons on your Android mobile phone. So, follow the below methods to proceed. First of all download the app named “Pie Control” from the Google Play store on your Android device and then install it properly by accepting all the prompted permissions. Now open up the app and then set up the buttons from the options inside the app. You can add many different buttons to control their corresponding actions but for adding navigation buttons add them under any of the tab i.e edge or left/right side and after that you can access these buttons from the preferred sides that can be by sliding the edge (if you have added buttons under Edge) or by sliding up the left/right side (if you have added buttons under Left/Right side). Your buttons will appear in a Pie style from where you can easily perform up to the designated actions of the navigation buttons. This is another such app which you can download from the Google Play store and then install it easily after following up the permissions. The only thing that makes this app different from the Pie Control app is its limits that are it can only add up the navigation buttons as Pie controls on the screen of the device. This can be although beneficial for some users those who don’t want to place a lot of hassle on their screen but just simply needed controls of navigation buttons. As the name of this app suggests i.e Back Button it also adds up the same unique style button on the screen through which one can perform the action of a back button placed in the navigational set of buttons on the device. This could be used just for adding up the back button on the screen and nothing else, you might need that for some purpose and don’t want to add too many buttons then use this app for sure. This app provides handy soft keys that simulate the three navigation buttons: Back, Home and Recent. It is easy to use and requires very low permission. It automatically starts when the device boots up and runs in the background. The app consists of Trigger Spot and Pie Controls that shows up when Trigger Spot is pressed. Both of them are able to fade off automatically when you do not need it. This app makes small (and resizable) soft keys that you can drag anywhere across the screen. For devices with soft keys as default navigational controls, this app is most effective when used in combination with CyanogenMod’s or ParanoidAndroid’s expanded desktop mode. 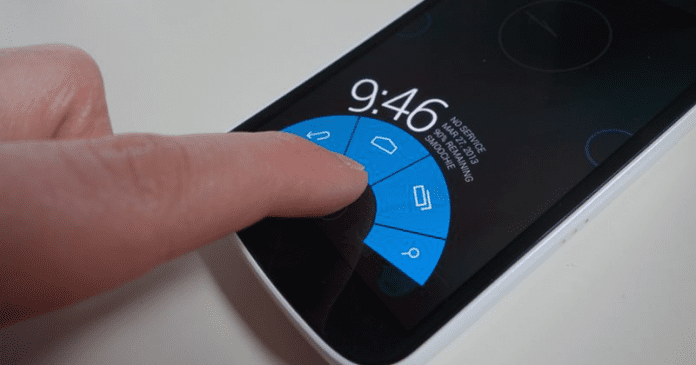 This app enables on-screen navigation buttons without even requiring root access. Well, this app is simple to set up. This app is designed for tablets. However, this works great with smartphones too. This app is will be useful if you have your hardware buttons broken. So above discussion was all about How to Get On Screen Navigation Button in Pie Style on any Mobile Device. And after reading up the above article, you might have got up a great idea and the method with which you can get on the screen navigation button of pie style on any of your mobile devices. This method won’t be harming your device and you can revert to the original state of your device anytime so don’t bother at all, just apply up to the method on your mobile device and get up the benefits and That’s it!